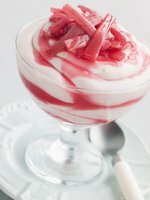 Rhubarb-Panna-Cotta recipes including rhubarb-cherry-compote, is just one way to add rich flavor. 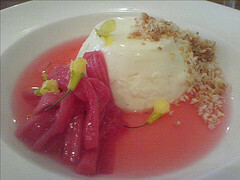 A panna-cotta with rhubarb is a wonderful variation of the plain vanilla. This popular Italian dessert translates in meaning to "cooked-cream" but actually, there is barely any cooking time involved at all. 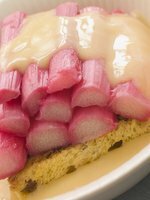 You may spend more time making the rhubarb sauce than you will the actual Panna-Cotta. 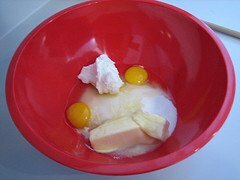 Milk, sugar and cream are mixed and cooked briefly, and then a thickener, usually gelatin, is added to enable it to set. The Panna Cotta is set aside until firm, and is best served chilled. Panna Cotta can be allowed to set in a large bowl, but ramekins are much better because it will take less time to firm up. Also, a ramekin or small glass can be inverted onto a single plate for an individual serving. Use a hot-water-bath (quick dip) to do this, and a knife to help it along. A single serving with a sauce is much more attractive. What a pretty dish! A Vanilla Panna Cotta is known as the traditional serving, but flavorings can be served in many forms like fruits, berries, and even sauces like caramel or chocolate. If sugar is left out of a Panna Cotta, it then becomes known as a "savory" dish. Sugar was so expensive in much earlier times as an imported luxury and so the "savory" Panna Cottas were much more affordable. In general, a Panna Cotta is custardy, easy to make, visually appealing, and just nice and light. 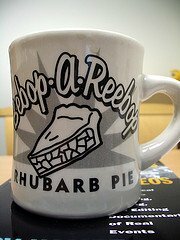 Try one with rhubarb. Remove from heat, and add the gelatin. Stir until gelatin is dissolved. Let the mixture cool and refrigerate. Give it an occasional stir, and remove the pods. 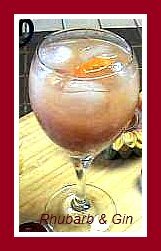 Gently mix, and divide into small glasses or ramekins. Chill covered for at least one hour. Coat rhubarb well with the sugar, and then slowly grill until browned. Set aside. Gently heat until well mixed, and then pour over the grilled rhubarb. Let sit 30 minutes. Keep the ramekins "intact" and add a spoonful of sauce or invert onto a plate beside spoonfuls of sauce and serve. Add 1 cup buttermilk to top half of a double boiler. Sprinkle gelatin over the top. Let stand 5 minutes. Separately, combine the sugar and cream and bring to a low boil in a saucepan. Now add it to the gelatin mixture. Place over a pot of simmering water, and stir until gelatin has dissolved. Add the rest of the buttermilk, and stir well. Strain through a cheesecloth-lined sieve and pour into your dishes evenly. Cover with wrap and chill for approximately 5 hours until they set. 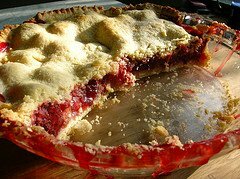 Combine all compote ingredients, and set aside for a few hours. Bring to a boil on low heat stirring occasionally. Remove from heat and set aside. Serve this dish with Panna Cotta inverted and compote spooned over the top or add compote to the top of the ramekin. Combine and simmer over medium heat. Remove, cover and let stand 20 minutes. Separately, sprinkle 2 1/2 tsp. of powdered gelatin over 3 tblsp. of water. 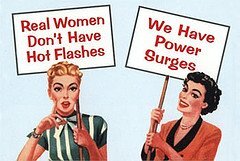 Let stand 4 or 5 minutes. Take the cover off of the cream mixture, and bring to a medium simmer over medium heat. Add in the gelatin mixture. Gently stir until gelatin is well dissolved. Remove the vanilla bean. Divide into 6-8 ramekins and cover. Let cool and then refrigerate until set. Combine all ingredients and simmer on low heat until boiled down to a sauce. This may require more sugar depending upon your tastes. Slowly add a bit at a time. Garnish your Panna Cotta on a plate or directly over top of your ramekins.